EXOR Studios (X-Morph: Defense) has announced that its next project is a sci-fi, hack-and-slash survival game with action-RPG elements. 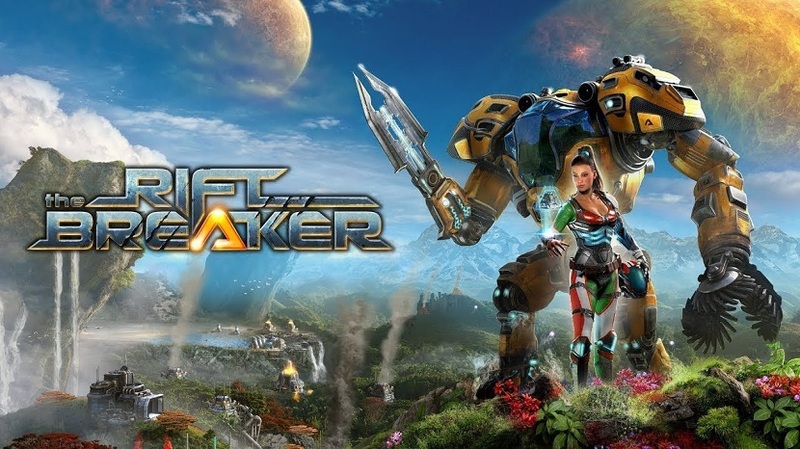 The Riftbreaker, which is in development for the PlayStation 4, Xbox One, and PC, will ship players to a distant planet, a few hundred years into the future. Players will play the role of Captain Ashley S. Nowak, aka The Riftbreaker, who enters a one-way portal to Galatea 3 in order to build a base that enables a round-trip back to earth. The aim is to colonize Galatea 3. Ashley has a mecha suit at her disposal, which she affectionately calls Mr. Riggs. The suit allows her to withstand harsh environments, and equips her with the tools to build the base and deal with enemies. Mr. Riggs also enables her to travel through rifts in space. BASE BUILDING – Your task is to construct a two-way rift back to Earth. This will be a very complex undertaking requiring enormous amounts of energy. Simple solar collectors and a few tons of steel will not be enough. You will need to build up an intricate chain of mines, refineries, powerplants, and research facilities to complete this mission. EXPLORATION – Galatea 37 is an unknown planet in the Sycorax belt of the Milky Way. Long-distance surveys have detected that it is inhabitable and perfect for colonization. The planet is full of rare minerals and substances that can be found in various locations around the globe. Varied biomes can surprise you with unknown fauna and flora as well as harsh weather conditions. Construct local outposts in resource-rich locations that will transport the required resources using rift technology. DEFENSE – Your presence on this planet will not go unnoticed! As you build up your industry and disrupt the natural order, the world will start seeing you as a threat. Build up your defenses. Construct walls, barriers, and defense towers as the attacks get stronger with every passing day. You will face thousands of hostile creatures trying to eliminate your presence. HACK, SLASH, SHOOT – Mr. Riggs can be equipped with powerful weapons and abilities that will allow you to take on the largest of beasts. 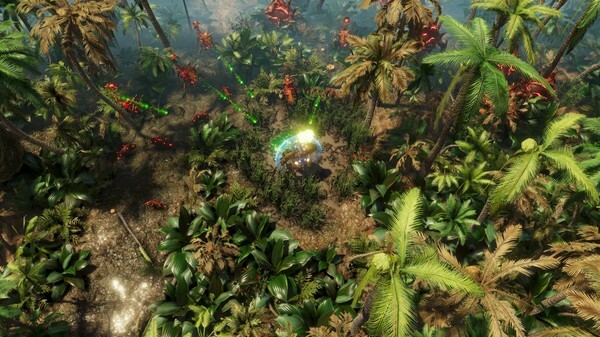 You will need to be ready to face lots of hostile alien creatures as you scout the planet. GATHER SAMPLES AND STRANGE ARTIFACTS – Fallen beasts will drop valuable research specimens as well as rare resources. Use everything you can gather to research and craft new technologies, buildings, weapons, and equipment. You can also scout the terrain using your sensors and dig for treasure buried underground. RESEARCH – Use the samples that you’ve gathered to research new technologies that will help you build up your base, improve your defenses, develop new blueprints for your Mecha-Suit, or improve existing technologies. INTERACTIVE STREAMING – The Riftbreaker™ has built-in integration with the most popular streaming services out there. The stream’s audience can actively participate in the game through multiple options, e.g. by voting to send waves of new enemies, spawning environmental disasters like a tornado, or by donating resources. THE SCHMETTERLING ENGINE – This game is built using the latest iteration of EXOR Studio’s in-house developed Schmetterling 2.0 engine, which was previously used to create X-Morph: Defense™ and Zombie Driver™. We pride ourselves in delivering fluid gameplay and utilizing all of your hardware’s capabilities: uncapped frame rate, support for widescreen monitors, customizable controls, and more. COMMUNITY-DRIVEN DEVELOPMENT – If you’ve read everything and arrived all the way down here, then you might be interested in helping us shape the game. Please come and talk to us on the forums, our official Discord server, or through any other of our social media. We’ll be sharing inside info about the progress of the game’s development, and we’d love to hear your feedback. Please come and help us make The Riftbreaker™ the game YOU want to play!